First of all it is martingale not martangale. Secondly it is numeraire not numerator. It sounds like you need to study the basics of risk- neutral pricing. A hint would be that the ratio of two asset prices has no expected drift in the appropriate measure. You are supposed to find the implied probability of the up- move and the down move assuming in (b) that the ratio of stock price to bond price has no expected drift and in (c) that the ratio of bond price to stock price has no expected drift. Not the answer you're looking for? 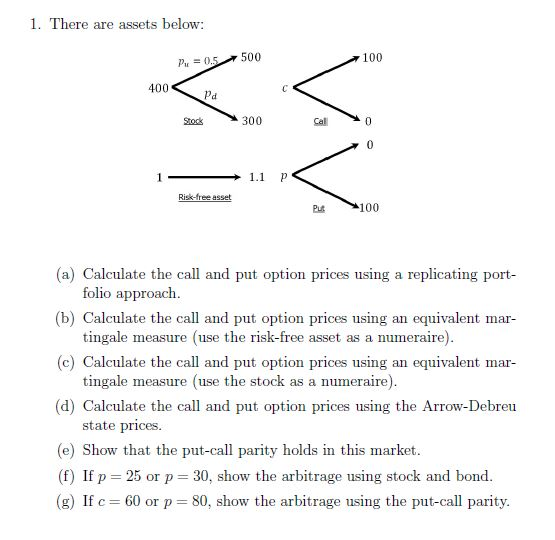 Browse other questions tagged binomial-tree financial-engineering or ask your own question. Is stock price priced in the uncertainty? What is some book that is complete and easy but hard enough to serve as prerequisite for asset pricing and portfolio choice theory?